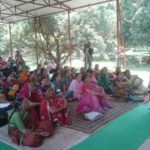 Mahila Anna Swaraj is Navdanya’s programme for women’s food sovereignty. It is based on celebrating and rejuvenating women’s knowledge and skills in biodiversity conservation, sustainable agriculture and food production and in artisanal organic food processing. We are the seed keepers, seed breeders and food producers, using our own traditional and indigenous seeds to produce nourishing, nutritious, tasty food, and resilient crops and communities. Since the last two decades GATT, WTO, World Bank, and corporations have started to highjack our seeds and seed sovereignty. More than 95% of the cotton seed is now Bt cotton, owned and controlled by Monsanto; this is pushing our families into debt and contributing to an epidemic of farmer suicides. We come from Maharashtra, where we have saved our local cotton and food varieties and created Gardens of Hope. With native seeds and organic farming we have doubled production and increased net incomes tenfold. In the arid and rain fed areas, corporate seeds and chemical agriculture has increased vulnerabilities to climate change and malnutrition. Monsanto’s hybrid corn is replacing healthy and nutritious corn everywhere and 75% of this corn goes to animal feed and industrial starch, which does not contribute to human nourishment. Untimely rain and hailstorms at harvest times, indicative of climate change, have devastated crops in Uttar Pradesh, Bundelkhand, Rajasthan and Maharashtra. Yet, we do not give up hope. With the seeds we have saved we will plant the future. With organic farming we will sow the seeds of climate resilience. The green revolution based on chemical monocultures has destroyed the fertile lands of Punjab, leaving dead soils, depleted water and a poisoned land. The cancer epidemic has taken thousands of lives. In spite of all the evidence that shows that agro-ecology and ecological agriculture conserve resources and increase productivity and are the answers to both ecological and food crises, there is an attempt to spread the devastating green revolution to the East. We come from Bihar, Jharkhand and Orissa. We come from Manipur, Assam and Arunachal Pradesh in the North-East and we will not let the green revolution spread to the East and devastate our biodiversity and water. The GMO Bt cotton has already taken lives in our cotton belt; there is now the false promise of genetically engineered golden rice for Vitamin A and genetically modified (GM) Banana for iron enrichment. We have rich biodiversity and knowledge that provides exponentially more nutrition than the false miracles being promoted by the biotech industry and their lobbyists. Our traditional seeds and food create delicious meals and can be the source of balanced nutrition everywhere through our Gardens of Hope. From Ladakh in the North to Kerala in the South, from Gujarat in the West to Manipur in the East, in every home and every village, we will reclaim our seed and food heritage to address the urgent problems of malnutrition, hunger and employment. Our rich biodiversity has been pirated again and again, with patents based on false claims to investors by corporations over what we have evolved across millennia. We fought against the cases of biopiracy of Neem, Basmati and Wheat and won; with our initiatives of saving climate resilient seeds, saline tolerant seeds, drought tolerant millets and wheat as well as heat and cold resistant beans, we will stop the nasty intent of biopiracy and patents on our knowledge and seeds. We will continue to freely save and exchange our seeds and will not let any law make seed a corporate property and interfere with our seed sovereignty and our rights. The seeds will stay free. We will stay free. No Comments to "Mahila Anna Swaraj – Food Sovereignty in Women’s Hands – Overview"